While several Chambers have a “shop local” campaign, we have taken a new and different approach. There are may be many other Macombs out there, but none of them are just like ours. Our members, our businesses, and our neighbors are what make our community unique; and you simply can’t put a price tag on that. Enter, #keepitinmacomb! What is “it” you ask? It is everything! It’s a way of life and the culture on our streets, square, parks, and more. It is not only items you buy, but services you use, entertainment options, places you go, how you choose to spend your time. It is anything you purchase or consume, tangible or intangible. However, and maybe more importantly, “it” is what we keep in Macomb when we choose to spend our money locally. Spending locally benefits education, transportation, health care, and public safety services like police and fire protection. So what is it? It is, literally, everything. How can you #keepitinmacomb? The easiest way to spread the message is to use the Shop Macomb logo and hashtag on your websites and social media to show your local pride. We also have window clings available for free in our office and an assortment of larger promotional items available for purchase. Don't worry, we're always hard at work coming up with new ways for you to participate. 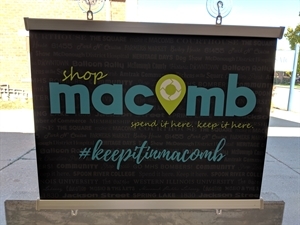 Tell your customers, family, friends, and visitors to #keepitinmacomb!